Wato (I) was requisitioned for naval service on 19 April 1941. Two days after commissioning she departed Port Adelaide for Darwin where she was based for eighteen months in support of naval operations in northern Australian waters. Wato (I) was in Darwin Harbour on 19 February 1942, when the Japanese launched the first of their sixty-four air raids on the city and port. 188 Japanese aircraft were involved in this raid which sank eight ships and damaged many of the other 35 ships present in the harbour. Darwin town and the RAAF aerodrome were also heavily damaged in the raid. A second raid of 54 bombers was launched two hours after the first. During the first raid the merchant vessel Barossa, berthed at the main wharf with an oil lighter alongside her, was set on fire. Wato (I), under the command of Warrant Officer Andrew Gibson, RANR(S) proceeded at great risk alongside the wharf, which was also on fire, and towed the oil lighter clear. In a outstanding display of seamanship Gibson then took Wato to the wharf opposite the burning MV Neptuna and took Barossa in tow. 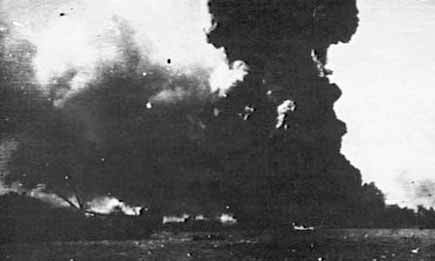 As Barossa was being towed clear the Neptuna, carrying a cargo of oil, ammunition and depth charges blew up. The violence of the explosion showered the entire port with debris as the ship disintegrated and Wato and Barossa were extremely fortunate to get clear. Barossa was beached nearby and her cargo subsequently burnt out. Wato then assisted in the rescue of crew members from stricken US Navy and merchant ships. 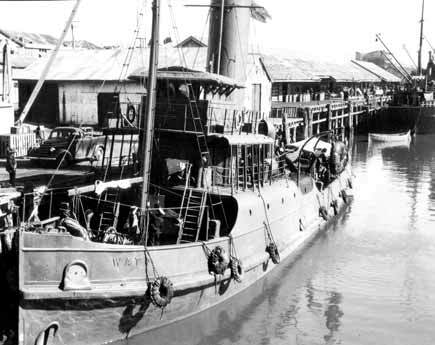 Following continuous service in Darwin, Wato (I) was transferred to the New Guinea area in November 1942 and served there until late 1944 when she proceeded to Sydney, where she arrived in December. For the remainder of the war Wato (I) was based in Sydney, where she paid off on 12 November 1945. She was returned to her owners, The Adelaide Steam Tug Company Ltd, on 27 May 1946.